Heat coals or gas grill for direct heat. Cut three 18x12-inch pieces heavy-duty foil. Spray with cooking spray. Mix beans, rice, onions, 1/4 cup cilantro, the oil, lime juice, garlic and salt. Place 2 bell pepper halves on one side of each foil piece. Fill with bean mixture. Fold foil over peppers so edges meet. Seal edges, making tight 1/2-inch fold; fold again. Allow space on sides for circulation and expansion. If you like, sprinkle the cooked peppers with shredded Cheddar or Monterey Jack cheese. 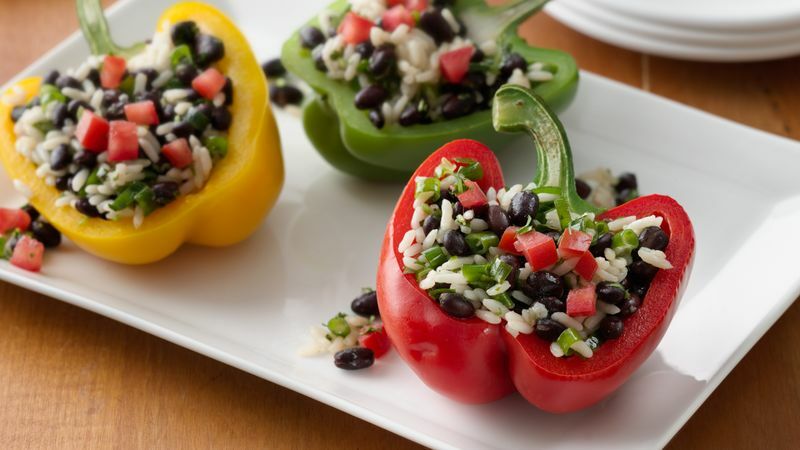 Any color bell pepper can be used for this recipe. For fiesta flair, try using a variety of colors. These meatless stuffed bell peppers can be served as a main dish with salad and bread, or they make a nice side dish with pork chops or chicken.